Darrell Etherington for TechCrunch: Another new entrant has joined the field of those offering self-driving tech to consumer carmakers — but this one likely has a bit more experience than most. Virginia-based Torc Robotics has been working on autonomous vehicle tech since 2007, when it finished third in the DARPA Urban Challenge, and it has applied autonomy in a range of commercial, industrial and military applications. 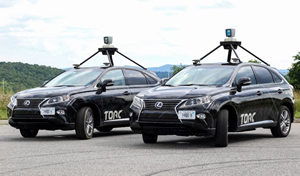 Now Torc is setting its sights on the consumer car market, with a self-driving car project based on its decade of experience, with more than 1,000 miles logged of autonomous driving in recent tests using two modified Lexus RX vehicles. These have been active on roads since February 2017, driving in “all weather” conditions according to Torc, and equipped with Torc’s in-house localization, mapping, navigation and object detection/tracking systems. One of Torc’s test vehicles performed a demonstration long-distance drive, making the 1,000 mile round trip from their Virginia HQ to Ford’s Piquette Avenue Plant in Detroit — a symbolic debut voyage to the heart of U.S. car country and the birthplace of the original Model T.